Shavuot is a few hours away, and this year I am taking the holiday off, which means rather than teaching all night I am free to wander the city and enjoy what other people are teaching. I last did this 2 years ago, which gave me the opportunity to attend a lecture by the late Professor David Hartman. I don’t remember the title, but I do remember him discussing ‘אלו ואלו’ (‘elu v’elu’) from tractate Eduyot – the bat kol or divine voice declaring ‘These and these are the words of the living God’ – that is, the opinions of both the schools of Hillel & Shammai are right, even though they disagree with each other. This helps me understand the significance of what the bat kol meant. It wasn’t only talking about Hillel and Shammai. It’s telling us that ‘elu v’elu’, themselves, are the actual words of the living God. It’s not merely that all approaches lead to living Torah, but Torah can only be kept alive through confronting and ultimately embracing the opposite opinion. This is the heart of Torah shebe’al peh, the process through which it lives, catalyzed at the very point of contention. Tonight I will drop into a local pluralistic beit midrash to learn with them. I then plan to attend a traditional shiur at the local Orthodox synagogue. 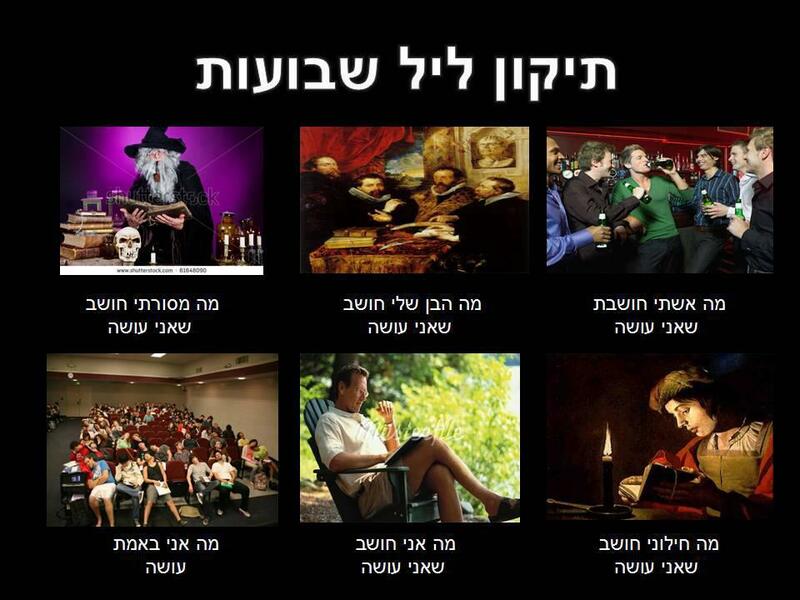 Around Jerusalem, and in other cities, people will be participating in tikunim in synagogues and yeshivot, on street corners and in museums, in private homes and open spaces. Some will approach learning from a feminist perspective, some will see it from al male oriented point of view. Some will be reading Amichai or looking for Jewish values in artwork and song. It will be an all-night celebration of ‘elu v’elu’ where everyone participating will be keeping Torah alive through the dynamics of engagement and discussion, of exchanging ideas even if we don’t share the same opinions. May we all be able to keep the ‘elu v’elu’ going long after the tikun is over. This entry was posted in A fence around the Torah, Babylonian Talmud, Bavli, Bein Hametzorim, Bible, Conservative Judaism, Cycleof the Jewish Year, Ethics of the Fathers, God, Haredi, Israel, Jerusalem Talmud, Jewish, Jewish Calendar, Jewish Learning, Jewish Life, Jewish Living, Jewish Medical Ethics, Jewish Parenting, Jewish Religion, Jewish ritual, Jewish Wisdom, Judaism, Kabbalah, Learning, Maimonides, Men of the Great Assembly, Moses, Oral Law, Orthodox, Orthodox Judaism, Orthodoxy, Parenting, Pharisees, Pirkei Avot, Prophecy, Prophets, Rabbis, Rambam, Reconstructionism, Reconstructionist Judaism, Reform, Reform Judaism, Religion, Religious coercion, Religious freedom, Religious Judaism, Sages, Samaritans, Sea of Halakhah, Shavuot, Shoah, Simon the Just, Sinai, Talmud, Tanach, Teaching Torah, Theology, Tikun leil Shavuot, Torah Shebe'al Peh, Uncategorized, Women, Written Law, Yerushalmi and tagged David Hartman, Feminist learning, Jerusalem, Kotel, Pluralistic Learning, Tel Aviv, tradition, Western Wall, Yeshiva. Bookmark the permalink. JT: Don’t think I said it. Do wish I had.